You pretty much have the correct list and order. I would add Runaway Mountain as it is a slow line and if there is much of a crowd it can be a wait. Titan will be close while you are at NTAG- you might wish to grab it then..otherwise you seem to have a good plan. if you don't visit often i would add ShockWave to the list. ShockWave and Titan both handle long lines fairly well. LaVorba and Pandemonium are the slowest IMHO. Enjoy. It will be HOT. Yeah, I'm not used to seeing those 100+ degree forecasts. We're New Yorkers, there's a good chance we'll die. We had a great time at this park last summer. Invest in a drink cup! Also, the old section of the park has a confusing layout, so study the map a bit beforehand. Riddler and La Vibora will have the longest wait times due to the slow throughput. It is not uncommon to see both an hour plus while everything else is a 10-15 minute wait. Titan and Shockwave have been walkons or a train or two wait every time I have been this year but I try to only go Sundays to avoid any craziness. Haven't heard anything about NTAG being down long term, pretty confident it will be good to go. Souvenir cups are definitely recommended. La Vibora, Pandemonium, Joker, and Mr Freeze are gonna be your typical low capacity coasters, though Freeze has a nice air conditioned queue and a dual-load station so it's not that bad. Runaway Mountain also pulls decent lines and is one of the best family coasters out there (restraints are wonky but the back row is way more fun than it should be). NTAG at rope drop on lighter days, depending on the operations and ride ops, can be 2-3 rerides before a line builds up, though these earlier rides are a little sluggish compared to later in the day (it warms up pretty quickly though). Vibora will probably open late. Getting to Titan is slightly confusing but not too bad, and following it up with a ride on NTAG is a great palate cleanser. Clockwise is generally a good way to hit the park. Judge Roy is pretty much exclusively a front seat ride, not for roughness but for airtime. Mr. Freeze is best on either end for forces and intensity, not to mention the spike. The log flume and mine train are supposedly the originals, and are fun (idk if it has it this season, but the log flume had a real funky smell last time we were there. a log flume enthusiast like yourself might appreciate a unique quality like that, not to mention its historical relevance, but the smell did kinda spread to a good third of the park lmao). The rapids ride will get you soaked, but is surprisingly immersive, not just for SF but in general. As for flats, S:ToP is a fantastic drop tower, the 400ft Star Flyer is fun (probably a worse view than SFNE's with their lake and all, but fun nonetheless, especially at night when the park's lit up), and of course Riddler Revenge (the giant frisbee) is fantastic. Yeah, this is a pretty flexible trip and we'll likely have multiple days at this park. We're flying into Dallas and headed down to San Antonio, so I feel like we'll start the trip here (before likely hitting the Rangers game that night) and probably end it there before heading to the airport. We can also swing by in the morning that second day if we missed something important. 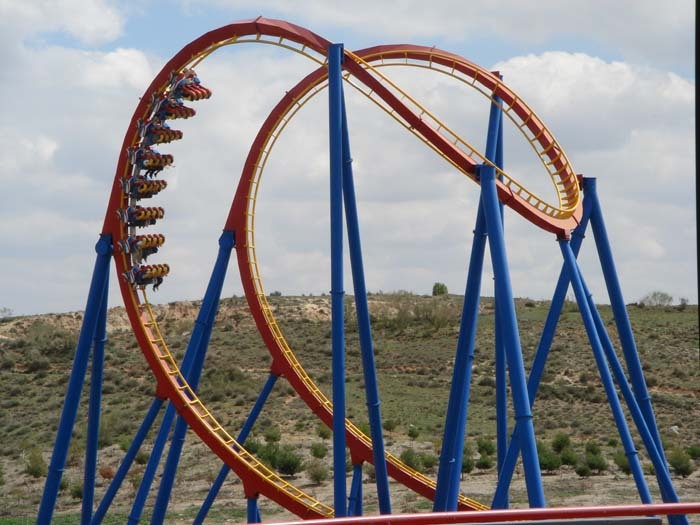 I have no doubt that New Texas Giant will run better as the day goes on but I feel like I'll end up heading there first just to make sure we get a ride in. While not likely, I'd feel dumb if something happened like it did last Sunday and the ride closed early in the day and didn't reopen for days and I missed out on it because I was riding a Gerstlauer spinner. I used to prioritize rides in order of capacity but I changed my tune after almost missing out on the RMC at Discovery Kingdom because I was busy riding a Tempesto clone. Obviously the plan is to head back there for tons of re-rides. As for El Aserradero... oh believe me, it's a huge draw. I actually considered doing a HITP trip once but decided against it since there's no way in hell I would make my first trip to the park that has the world's first log flume on a day where I couldn't ride it. I mean... come on. thrillrider wrote: We had a great time at this park last summer. Invest in a drink cup! Also, the old section of the park has a confusing layout, so study the map a bit beforehand. I'd reiterate this — it's surprisingly maze-like in that section, and it's one of the first parts you'll hit. New Texas Giant is a priority (still my favorite RMC out of the ones I've ridden as it's more of a traditional coaster design), but Runaway Mountain is worth getting on early too — especially if it's a busy day. It's a small, off-the-shelf design, but done in a quirky way. La Vibora's surprisingly uncomfortable, but worth knocking out early because of its poor throughput. Judge Roy Scream is a fantastic classic-style coaster that's well worth waiting for (if classics are your thing). Does Runaway Mountain have an air conditioned queue? If so, maybe we'll save that for later and love every second of standing in it. If not, never-mind. Much of it is outdoors if I remember correctly. I actually screwed up when I was there and walked in through the exit (I didn't know that the ride was exempt from fastpass), and the ops just threw me on an open seat rather than sending me back to the entrance.